Usually we get good sashimi items for Catalina offshore products for new year’s eve. This year, they did not have any good tuna or sea urchin. We had to do without them on the new year’s eve. Since I bought the half filet of salmon (over 4 lb), even after making salmon kelp rolls as well as “Russian” marinated salmon, we had a good amount of salmon left including the skin. So no sashimi this time and we had salmon and filet mignon. When I made salmon kelp rolls, I needed to trim the salmon to make it even square logs. 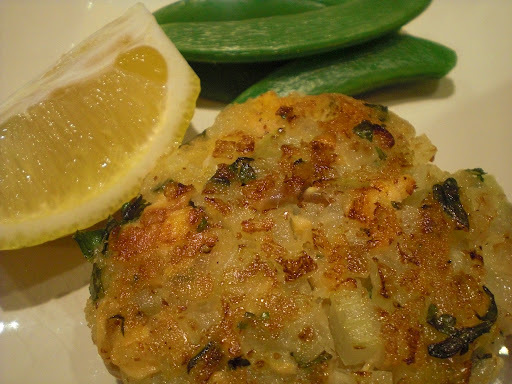 Using these trimmings I made salmon cakes. Since some of the pieces were still large chunks, I finely minced the half of the salmon trimmings finely (which binds the other ingredients) and the remaining cut into small cubes. Other ingredients are finely chopped onion and celery (sautéed in butter, seasoned with sat ad pepper and cooled), finely grated zest of lemon, finely chopped parsley, Japanese Panko bread crumbs, Dijon mustard, mayonnaise and seasoned with salt and pepper. I then made a small flat cakes and fried them with a bit of olive oil. Using the more intact portions of the salmon left, I made cubes of teriyaki style salmon with separately cook crispy salmon skin. 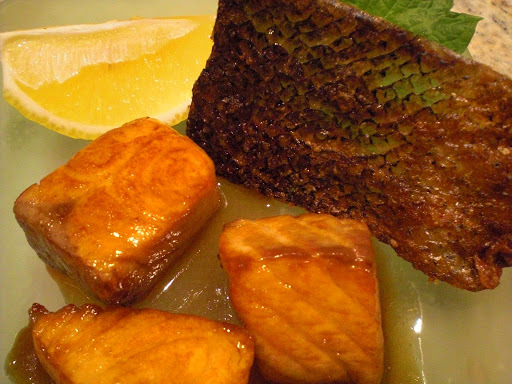 I just seared all surfaces of the salmon cubes and then braised in a mixture of sake, mirin and soy sauce (1:1:2 ratio) until liquid evaporate and sauce became somewhat thick. 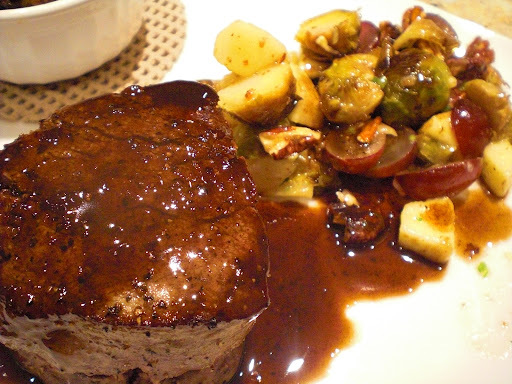 Finally, we had a filet mignon, stuffing (re-heated in small ramekin with scripy bacon), and apple-blackend Brussels sprouts salad. Baked (blacken) brussels sprouts were sliced, red seedless grapes halved, apple (we used Fuji), skinned and cubed dressed in honey mustard dressing garnished with toasted walnuts. I made a quick sauce by degrazing the pan with port wine, reduce it in half. I then added balsamic vinegar and reduce it a bit and finished with several pats of butter. 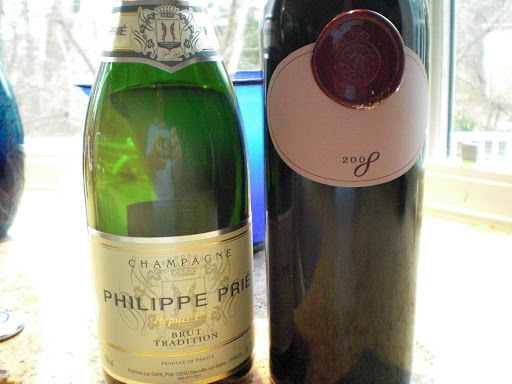 For libation, we had NV Philippe Prie Brut with cheeses and salmons (the picture taken morning after). For us, differences in the quality of champagnes are very subtle after a certain price point but this was a quite nice one. Then with steak, we switched to 2008 Buccella Merlot . This is a quite amazing red! We really enjoyed this with filet mignon. We managed to stay up until mid-night to see the ball to drop in on TV.